CORPORAL Ashley Birt has begun his last long journey home to Gympie, after a moving memorial service in Afghanistan. 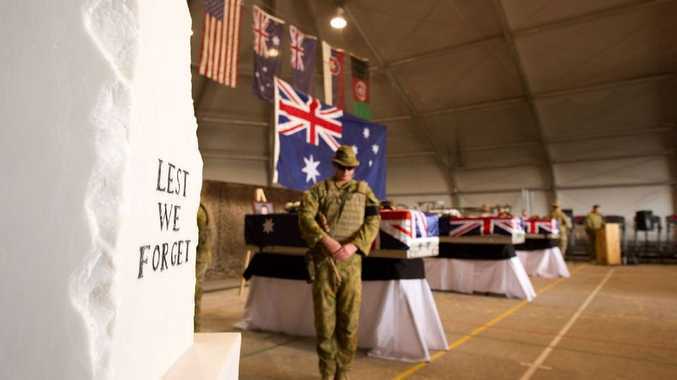 The service, on Tuesday morning (Afghan time), was held at Multi National Base - Tarin Kot and was attended by thousands of his Australian, Coalition and Afghan comrades. Corporal Birt, 22, was one of three young Australians who were tragically killed on Saturday, when a rogue Afghan soldier turned upon them and opened fire, immediately following a parade. Captain Bryce Duffy, 26 and Lance Corporal Nathan Gavin, 29, were also killed. Australian Defence Force commander in the Middle East, Major General Angus Campbell, said the army had lost three courageous soldiers who had served with distinction. "Cpt Duffy, Cpl Birt and L/Cpl Gavin were held in high regard by their mates and their commanders and their loss has deeply affected all Australian and Coalition personnel serving in Afghanistan and the Middle East," he said. "In true ANZAC spirit they gave their all because they believed they were making a difference for the people of Afghanistan - their sacrifice will inspire us as we go about our crucial mission here in Afghanistan," Maj Gen Campbell said. Australian commanders in Tarin Kot reflected on the qualities of the soldiers during their eulogies at the service. 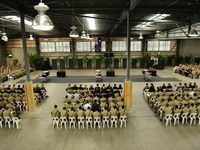 Deputy Commander CT-U, Colonel Dave Smith remembered Cpl Birt as a popular soldier who was highly regarded by his peers. "He was a well-respected member of CT-U headquarters and an outstanding soldier who was everything we want in a junior non-commissioned officer." Commanding officer of MTF-3, Lieutenant Colonel Chris Smith described Cpt Duffy as a reserved bloke with a sharp wit. "He was a talented and dedicated young officer. This was his second tour of Afghanistan, having served with the first Mentoring Task Force," Lt Col Smith said. "His comrade, L/Cpl Gavin, was also a fine and courageous soldier who was dedicated to the task of mentoring the soldiers of the Afghan National Army. "(He) was a loving husband and father who had an infectious laugh and loved a joke. He leaves behind his wife Jackie and three lovely kids; Joshua, Holly and Olivia." Maj Gen Campbell also acknowledged the seven Australian soldiers wounded and the Afghan casualties from the same shooting incident. At the conclusion of the ceremony, Australian, Coalition and Afghan personnel lined the road from the memorial service to a waiting RAAF C-130 Hercules, saluting as the three flag-draped caskets moved through their ranks. Col Smith said the three soldiers would never be forgotten.